Departing daily at 09:30 from Zakynthos port. Coasting towards the north-western part of the island, we'll go by the beaches of Tsilivi, Alikes, St. Nicholas - Schinari, and we'll stop at the Blue Caves to take some pictures.Next stop: The world-famous Shipwreck (Navagio). 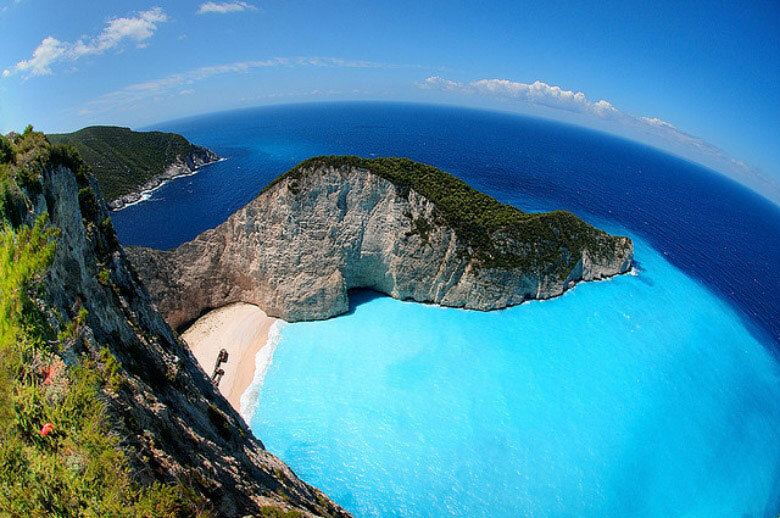 You'll have enough time at your disposal to enjoy the most celebrated beach in Greece with the white sand, and you'll swim to the unique cave with the millions of dazzling colours. Our next stop is Porto Vromi, a fishing village, where we can take nice pictures. The culmination of the cruise: The Dolphin's Caves, where the ship enters slowly - you may touch the rocks with your hands! Next comes swimming at the caves of Keri and Oasi beach. After Keri, the bay of Laganas offers us an opportunity to look for the famous Caretta-caretta sea turtle. A great experience for the first spotter, and a great picture subject for all. Our last stop for swimming is at Marathonissi or Mavratzi beach. We'll coast by Porto Zoro, Banana, Porto Roma and Argassi beaches on our way back to Zakynthos port.